“The day of the royal massacre started out like any other.” And with that hook, so begins Kill the Queen, the first installment of Jennifer Estep’s Crown of Shards series. Lady Everleigh, Evie for short, is an orphan raised in the queen’s household after the death of her parents. As a “mutt,” a person with limited magical abilities, and a noble standing far down in the line of succession, she is relegated to tasks too onerous for the higher-ranking members of the royal family. Surrounded by intrigue and deception, she gets along by keeping her head down, fulfilling her limited duties, and relying on her few close friends. This environment of mistrust and manipulation sets the stage for the massacre that sets the story in motion. Only Evie survives the slaughter. On the run, she finds safety by joining a troupe of gladiators. Gladiatorial combat is a central part of the culture in the kingdom of Bellona, with the greatest troupes and warriors rising to legendary status. Evie finds a place working as a baker for the group led by Serilda Swan, perhaps the greatest of all gladiators and a former close ally of the deposed queen. But can Serilda be trusted? Though her experience in hand-to-hand combat is limited, Evie carves out a place for herself, relying on the strength of character she developed growing up in the palace. As the story progresses, Evie shows her mettle as she trains as a gladiator, uncovers plots within the troupe, and develops her magical abilities as she moves toward the inevitable showdown with the queen’s killer. One of the strengths of the story is the way in which Evie’s magical talents and her combat skills develop incrementally and are consistent with her physical limitations. Unlike some fantasy novels, she doesn’t become a powerful warrior or sorcerer in the span of a single novel. Instead, she must call upon all of her knowledge and skills and innate resourcefulness to survive. Evie doesn’t suddenly develop previously unsuspected superpowers, nor does she discover a powerful talisman or arcane lore. The story comes to an exciting and satisfying conclusion, and doesn’t feel like a cheat. The novel is not without a few classic tropes. Villain takes a break from slaughtering everyone in sight so that that the heroine may receive important information from the dying queen. Villain is about to kill the heroine, but takes a break in order to give a speech explaining her sinister plot, thus allowing the heroine to escape. Heroine falls from a great height, lands in a river, and escapes with only torn clothing. These few early moments aside, Estep crafts an engaging and original tale that keeps the reader turning the pages. 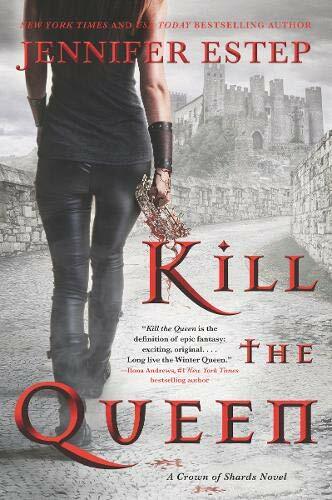 With its strong female characters trained in hand-to-hand combat, and a protagonist with a bent for sarcasm, Kill the Queen is reminiscent of Mark Lawrence’s Book of the Ancestor series. Jennifer Estep’s engaging style and a perfect balance of action and intrigue make this a strong first installment of a promising new fantasy series. Although it is book one of the series, Kill the Queen is written in such a way that it can be read as a stand-alone, so there’s no need to wait for the series to be completed before diving in. David Wood's most recent book is Exile: A Jade Ihara Adventure, the third book in this action-adventure series. He is also an author of thrillers, and under the pen name David Debord is an author of fantasy novels.